A cement tile roof is an affordable and attractive way to top off a house. 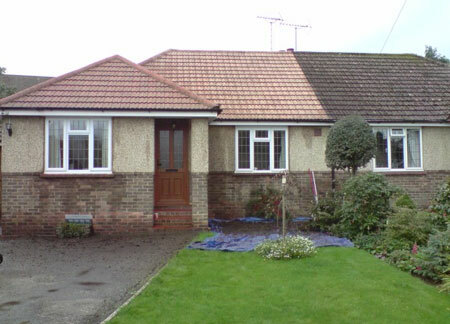 This type of roof looks good for up to 10 years but the colour does tend to fade over time. The problem is solved by applying cleaning the roof tiles and applying a quality roof paint to ensure that your home looks good for many more years. Exposed to extremes of climate the roof of a home expands and contracts which results in faded colour, loose tiles and possibly loose cement on ridge caps. Annual inspection and regular maintenance makes sense, and can help prevent spending money on costly future repairs and a roof that is kept in good condition means that your home is protected from the elements. For the do-it-yourselfer, cleaning and painting a roof needs to be planned properly, using the proper tools and equipment and using quality paint. Apart from the height and working on a wet slippery surface, cleaning your roof yourself is a relatively simple process and only costs as much as the chemicals you use to do the cleaning and painting. Paint roller with long handle or Bosch PFS Spray System. 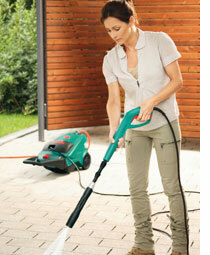 *If you have a high-pressure washer, your job is much easier that having to scrub. Simply washing the tiles with this can get almost all the dirt and filth off your roof in a matter of minutes. It is still a good idea to have the bleach solution handy to assist with any stains. Roof paint should offer UV resistance to extend the painted surface and be waterbased for easy cleaning and short recoating periods, reducing the time spent on the roof. Prominent Paints Roof Paint can be used on both cement roof tiles or corrugated iron roofs and is easy to apply. Plus, the product is specifically formulated with outstanding adhesion to cope with flexibility of galvanised gutters and cladding under varying temperatures. Added benefits are that Prominent Roof Paint contains anti-fungal properties. The product can be tinted to specific colour requirements, and for those who prefer eco-friendly products, Prominent Roof Paint is 100% lead free. 1. Clean the roof surface with a soft-bristle brush - a sweeping brush will do -to remove loose dirt and larger debris that may clog your gutters or damage the roof while washing. 2. Wet the roof surface with a garden hose and allow the roof to soak for at least five minutes. This will loosen dried dirt and make cleaning easier. Tackling this project is best done in Autumn when it is not too hot or windy. 3. Sweep the roof again with the sweeping brush and then rinse to check that the roof is clean. If the roof is still dirty, re-wet the surface and allow it to soak for another five minutes. 4. Apply cleaner to the roof while soaking once again and scrub lightly with the sweeping brush. 5. Give the roof a final rinse with clean water before the soap has a chance to dry. 6. 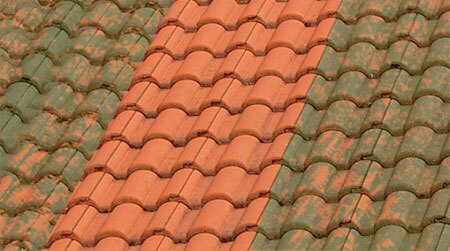 Allow the tiles to dry before applying roof paint as per the manufacturer's instructions. Note: If there are areas of fungal or mould, using a bleach and water solution that is 1 part bleach to 4 parts water and scrubbing with the sweeping brush will remove and effective kill the growth. You need to thoroughly rinse the roof when you are done and take care not to slip, as bleach can make tiles slick. If you live in at the coast, or have many large trees that shade your home, watch for mould and moss growing on the tiles. You will need to remove this as soon as you possibly can to keep your tiles looking beautiful. Mould and moss can stain the tiles, and even cause underling problems if allowed to sit.